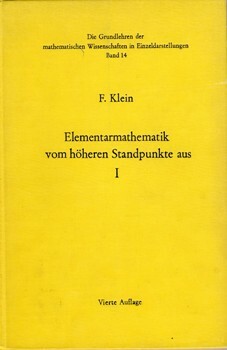 In 2008 IMU and ICMI commissioned a project to revisit the intent of Felix Klein when he wrote Elementary Mathematics from an Advanced Standpoint one hundred years earlier. The aim is to produce a book for upper secondary teachers that communicates the breadth and vitality of the research discipline of mathematics and connects it to the senior secondary school curriculum. The 300-page book, prepared in more than 10 languages, will be written to inspire teachers to present to their students a more informed picture of the growing and interconnected field represented by the mathematical sciences in today's world. We expect this will be backed up by web, print, and DVD resources. For more information see More Information below. See also the IMU-Site of the "The Klein-Project"
The book cannot be either comprehensive, nor definitive of the field. The text will emphasise links between branches of the field and generic themes (such as the impact of computing). Insights from mathematics education will not be addressed specifically but will be implicit in many places. The Design Group seeks input from all those working in the mathematical sciences, researchers and educators alike. We welcome written communications, but will also be holding several "Klein conferences" around the world where feedback on draft ideas and material can be given, and original contributions offered. The actual writing will be done by invited authors of proven experience in expert and inspiring authorship. Anyone wishing to be on a mailing list to be kept up to date and receive draft material is invited to send an email in the first instance to Bill Barton. See also the Klein-Project-Homepage and the Klein Vignettes. You are welcome to contribute to these wiki-pages. If so, you have to register. Please send an email to Wolfgang Weigel. Diese Seite wurde zuletzt am 5. Februar 2013 um 13:21 Uhr geändert. Diese Seite wurde bisher 137.390-mal abgerufen.